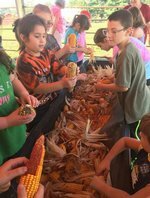 Bulls Gap School: Highlights - 2nd Grade Farm Day! BGS second graders took a trip to the farm with Miss Thacker and Mrs. Jolly this week! Students learned about growing a garden, pets on farms, milk cows, and other fun and interesting facts about farms.